When we decided to go for trip to yercard these are 3 things top of our mind. Co -yoga practitioners decided to test the outcome of practice . Organised by Vishy , accepted by suresh &poornima with their daughter Akshara , me and Cauvery , Govind and guru ramanan. Went through road no idea of waiting experience , Vishy gave good built up on Suhaas who is the owner of the 15 acre estate we planned to tent and stay . He provides food and also leads trek. wife . We ate the food naturally 🙂 so bland . Suhaas try to educate us about how he choose his career , his estate life, about coffee seeds, mangoes and pepper . Made us feel bad about our selection of chicory coffee and he offered as sunrise … Ssshhhh . He gave us schedule for the day and the same evening his assistant took us to small peak in estate . Also took us to little higher plane and taught us how to install tents . It was sunny day every one was excited about their own tent stay . We went to the small peak before the sunset , it was beautiful scene . On return his care taker told us a story of how he saw a cobra and he requested not to harm him and cobra left . We where also looking for bison which was described by suhaas that if we are lucky we might see a majestic 6 foot tall bison including its horns. Since It was chased continuously by care taker and bison may not like to visit our estate. Estate had good toilets and solar lamps . Once we had dinner by 8 pm, we chatted for an hour and want to hit the tent , travel hangover also there for some Collected some sheets and pillows and went up to tent , weather was very warm . We expected some rain to cool our night , but our discomforts during early part of night was overrun by the fun we had by criticising each ones decision to stay the tent . But we had less option but to sleep. The night was meditative , heights of silence in forest and we heard pthe smallest movement of dry leaves and the sky was open to us , including all sides , each time I open my eyes , look for majestic bison or ssshh sound of snake . It was sleep with highest consciousness . Late in the night it became cold and I think we had yoga Indra . Morning it was planned to move in to forest trek by 6 am . It was around 6.15 M we started to move in . It was nice trek down to a stream . Suhaas taught us how to move inside the forest , every one should talk , side and small steps etc. The flexibility of each one of us tested reached a stream in approximately an hour . Had some sense of achievement . Yoga has helped us to be conscious all through out. Stream did not have water flow. . Realised Climate changes has big effect on our natural resource . Every one had good sweat and rested for 30 minutes . Small pond 2 of us dipped and felt the water . Decided to move up , it was steep hike and when guide told us we have to take 12 hair pin bend decided i should not count . Because the knee started bearing the wait with difficulty in the first hairpin bend . 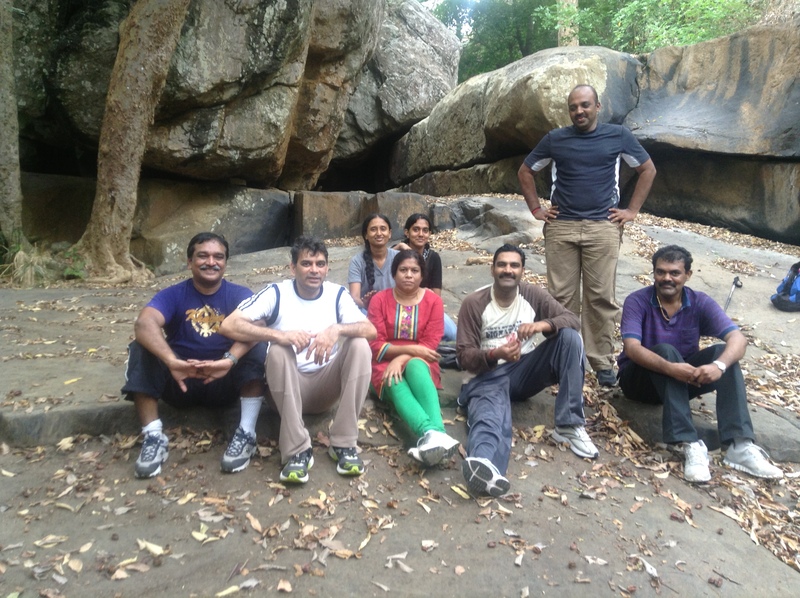 But our asanas made us move faster to the top . What a sense of accomplishment . Stated to myself Still I have energy , strength , mental power and guts every one of us was happy to have breakfast . Off course we had tiredness , some of us felt fatigue . 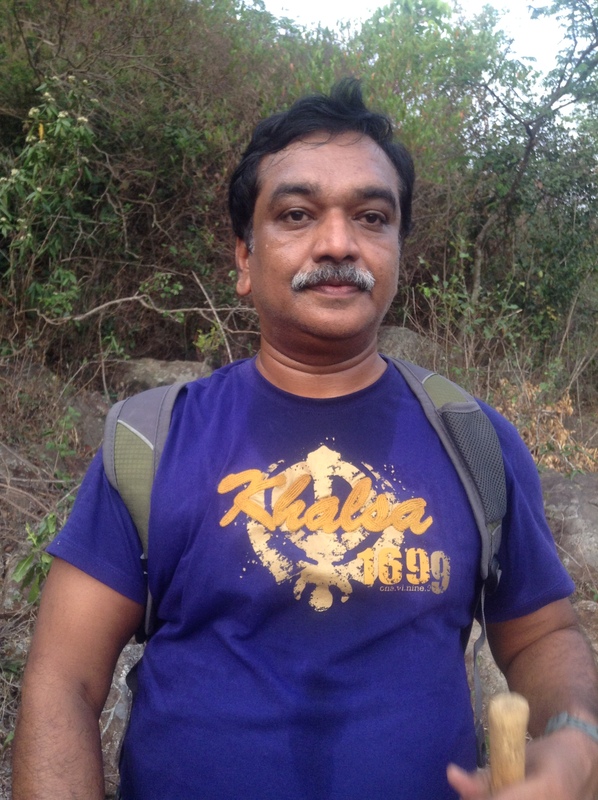 One more achievement was Cauvery experienced a trek . We went to yercard town for the night stay . Lunch was in GRT , most of us wanted to have food which was cooked in Indian style not in Suhaas style . Had evening walk with all road side eatery tasting . Monday morning climbed down with good memories . Back to urban living . Planning for next one . lovely… invite us next time.